Aria food & bakery is the first and only Persian bakery in the U.S Northwest. It is located at Kirkland WA,Totem lake area. At Aria Food & Bakery, delivering quality and distinctive products to our numerous customers is our top priority and that is why we ensure that we collect only unique and special products at all times. There are several reasons why Aria Food & Bakery is the name one everyone's lips and that is due to the fact that we have an array of high quality products. 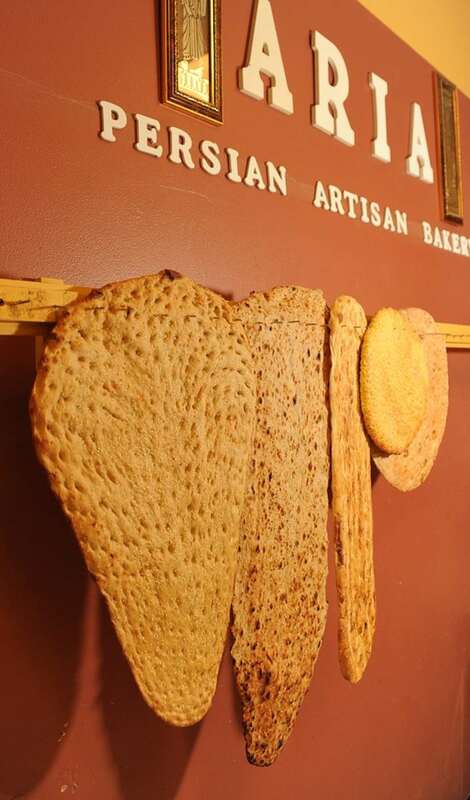 One of outstanding attractions is producing 7 diffrent kinds of most popular and treditional Persian flat breads (SANGAK, BARBARI WHITE & WHOLE WHEAT, TAFTOON, AFGHANI, SHEERMAL AND BARELY BREAD) that are baked fresh daily with some of the best baking equipments available to mankind. If you are wondering what makes each of our 7 breads diffrent from each other, we are glad to tell you that each of these breads vary on flours, ingredients, sizes and forms. All breads are handmade and they are baked by custom made oven right in the presence of the customers which means in baking time any bread you buy from us coming directly from the oven into your hands. At Aria Food & Bakery, we make use of high quality flours in the production of our bread. You do not have to worry because we do not use any form of chemical or preservative which is why our bread is reputed to be one of the healthiest and most delicious bread available in the whole U.S Northwest. Apart from bread making which is one of our areas of specialization, we at Aria Food & Bakery are also involved in making and collecting a mix of traditioal and modern Persian cookies, pastries and cakes. Third on our list at Aria Food & Bakery is our exclusive menu for Mediterranean pizza and sandwiches, soup, salad and desserts that were made with fresh materials and Halal products that we use to remind Persian Nationals about their home country. It does not matter whether you are from the Middle East or not, as long as you love quality and new food, then Aria Food & Bakery is the name that should be on your lips. We also have some uniqe sandwiches that are wrapped with a loaf of fresh SANGAK bread. Feel free to contact us if you have any inquiries or would like to buy some of our amazing products. We hope to see you soon. © 2019 ARIA FOOD & BAKERY. All rights reserved. View site map. ARIA FOOD & BAKERY website is served by Flavor Plate.